So, because I don't know if I'm going to get sued if I start a blog called The Artist's Way for Beaders without permission from Julia Cameron, I'm just going to start this off on my blog, and then if I can work that out, I'll move these posts later. 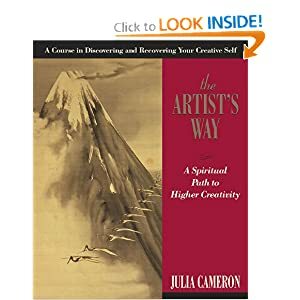 The Artist's Way is a fabulous book and method for unlocking your latent creativity, written by author, playwright, poet, and screenwriter Julia Cameron. I used it for the first time many, many years ago when I was a budding writer/bead artist, and as I've gone back and done it again and again over the years, I've found new ways of modifying the basic tools and exercises so that they are more relevant to my beadwork. The Artist's Way is a twelve-week program where each week, you'll complete certain tasks and answer questions from the book as you discover how to allow yourself to be more creative. What I have found through my work with The Artist's Way is that with a little nudge, these tasks and questions can be extremely useful in dealing with Beader's Block, too! If you want to join us in the Facebook group, The Artist's Way for Beaders, just head on over to the group and ask to be added. Any and all are welcome to join, no matter what kind of beading or beadwork you do! Next, you'll need a copy of the book, The Artist's Way by Julia Cameron. Once you're ready to go, read on for how we'll be changing things up a bit as we work our way through our creative beading blocks!